WASHINGTON, D.C. — President Barack Obama’s top national security adviser is resigning and will be replaced by Susan Rice, the U.S. ambassador to the U.N. who has been a lightning rod for Republican criticism over faulty explanations for the attack that killed four Americans in Benghazi, Libya. Tom Donilon has been a key foreign policy adviser to President Barack Obama. But the 58-year-old had been expected to depart sometime this year, with Rice seen as the likely candidate to replace him. Rice’s selection was greeted by a muted response from some Republicans who had earlier accused her of being part of an administration cover-up in the Benghazi attacks. Rice, a close Obama confidante, came under withering criticism from Republicans as part of the investigations into the deadly attack on a U.S. compound in Benghazi. Relying on talking points from the intelligence community, Rice said in television interviews that the attacks were likely spontaneous, which was later proven incorrect. Obama considered nominating Rice as his second-term secretary of state, but she withdrew amid the GOP criticism, saying she didn’t want her confirmation fight to be a distraction for the White House. The president instead nominated John Kerry, who easily won confirmation from his former Senate colleagues. 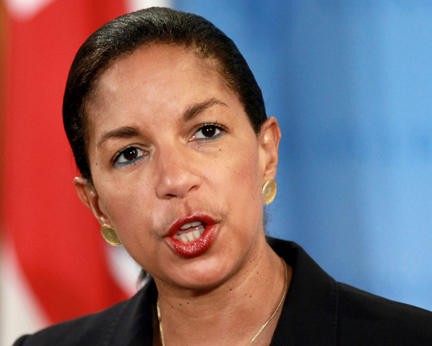 Rice's new post as national security adviser does not require Senate confirmation. A White House official confirmed the foreign policy personnel changes Wednesday morning ahead of a planned announcement by the president in the afternoon. The official spoke on condition of anonymity to discuss the changes before they were publicly announced. Obama will also name Samantha Power, a human rights expert and former White House adviser, to replace Rice at the United Nations. Power left the White House earlier this year. Power won the 2003 Pulitzer Prize in general nonfiction for her book “A Problem From Hell: America and the Age of Genocide,” which examined U.S. foreign policy toward genocide in the 20th century. She is a graduate of Yale University and Harvard Law School. According to a biography on the White House website, Power also served as a professor at Harvard's John F. Kennedy School of Government, where she taught courses on U.S. foreign policy, human rights, and extremism. The White House official said Donilon is expected to stay on the job until early July, after Obama wraps up overseas trips to Europe and Africa, as well as an unusual summit in California later this week with Chinese President Xi Jinping. Donilon has overseen a foreign policy agenda at the White House that put increased emphasis on the U.S. relationship with Asia. He’s also played a key role in the administration's counterterrorism strategy, including the raid that led to the death of Osama bin Laden, and in managing the complex U.S. ties with Russia. Rice, who first started working for Obama during his 2008 presidential campaign, has a close relationship with the president and many of his advisers. She’s known for being outspoken on human rights issues and also pushed for a more interventionist strategy in Libya.